Emma Frost, voiced by Susan Silo, appeared in an animated television pilot called "Pryde of the X-Men." She was a member of Magneto's Brotherhood of Evil Mutants. 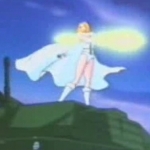 Emma Frost periodically appeared in the 1992 "X-Men: The Animated Series" as White Queen of the Inner Circle. She appeared in the first three parts of the Dark Phoenix Saga and was shown briefly among a group of telepaths in the episode Beyond Good and Evil Part 4: End and Beginning. "Generation X" was a live-action television pilot that was roughly based off of its comic book counterpart. The low budget film was released in 1996 and received negative reviews among viewers. The main characters were Banshee and Emma Frost, who were headmasters of the Xavier's Institute for Higher Learning. The team clashed with a mad scientist named Russel Tresh, who used an evil machine to develop psychic powers. The show stopped developing after the pilot episode. Emma Frost played by Finola Hughes. Aired by Nicktoons in the United States, "Wolverine and the X-Men" focuses on the X-Men without Professor Xavier but led by Wolverine.Kari Wahlgren voices Emma Frost in "Wolverine and the X-Men." Emma Frost demands to be recruited by Wolverine to help find Professor Xavier because she is the only available telepath to use cerebra. She becomes romantically interested in Cyclops, but he is too stressed over the missing Jean to notice Emma's interest. The season finale reveals Emma was working for the Hellfire Club, who hoped to unleash the Phoenix to gain power. She was responsible for the missing Jean Grey because she and the Stepford Cuckoos miscalculated their telepathy. When the Hellfire Club releases the Phoenix Force from Jean Grey, it heads to the city to unleash mass destruction. But Emma feels guilty enough for causing troubles in the X-Men, so she transforms to diamond form and successfully contains the Phoenix within her diamond shell, but it shatters. She is presumably dead after that. The show was not renewed for a second season to find out Emma's fate, but Associate Producer Joshua Fine said in an interview that she would have placed her consciousness into Jean for a return in season 2. Summary: The story begins when an explosive event destroys the X-Mansion. After the destruction, Jean Grey is suddenly missing, and Professor Xavier is missing as well because he is stuck in the future. Although the mansion is destroyed, the Professor encourages the X-Men to continue with their lives because the future needs them. Cyclops is depressed over the loss of Jean Grey, so Wolverine leads the X-Men to prevent the apocalyptic future while fighting villains such as Magneto and the Brotherhood. Although the show received mostly positive reviews, season 2 was axed due to lack of funding. Below is a list of appearances Emma Frost has appeared in "Wolverine and the X-Men." Wolverine recruits Emma Frost into the X-Men. Using Cerebro, she searches for Professor Xavier and finds him in Genosha with Magneto. The X-Men travel to Africa to rescue Storm. Emma Frost fights the Shadow King, who is controlling Storm. Gambit steals a collar that suppresses a mutant's abilities. It's up to Wolverine to take the thief down. Meanwhile, Emma Frost brushes her hair in this episode. The Brotherhood releases a dangerous mutant named Nitro from the MRD. It's up to the X-Men to stop any damage the powerful mutant can ensue. Cyclops misses Jean Grey and leaves the X-Men to search for her. And only Emma Frost supports his decision. The Brotherhood are at it again and release Tildie Soames, a young mutant whose nightmares become realities. The X-Men try to stop her, while Rogue tries to regain her trust. Emma Frosts continues to get close to Scott Summers. She offers to erase every memory of his lover Jean Grey. More backstory is revealed as to why Jean Grey went missing. Emma Frost (Kaori Yamagata) appears in Madhouse’s X-Men Anime, which is written by Warren Ellis. The casting, story and artwork are influenced by Whedon’s “Astonishing X-Men.” The show takes place a year after the death of Jean Grey and the disband of the X-Men. When Hisako goes missing, Professor X sends the X-Men to Japan, where they encounter a supremacist group called the U-Men.